Just how bad was Tim Burton's Superman movie going to be? Well, the Last Son of Krypton would've been wearing a light up disco suit. 'Nuff said. Between Superman IV: The Quest for Peace and Superman Returns, there were a number of movie attempts to bring The Man of Steel back into the movie theaters. Of the many attempted films, none has become more infamous than Superman Lives, the movie that had Tim Burton and Nicholas Cage attached to its production at one point. Some new concept art and photos from the film have recently surfaced on the Web; looking at the images, it was probably for the best that the movie died in development. While the movie never got out of pre-production, art and costume prototypes were developed under the guidance of Steve Johnson, who's gradually been releasing concept art and photos of what his teams developed in preparation for the movie. With the current release from Johnson, it's been revealed that Doomsday was intended to be the movie's main villain ... though I'm not exactly in love with the concept art for that character. Readers will probably also be confused by the "disco suit" in some of the photos. 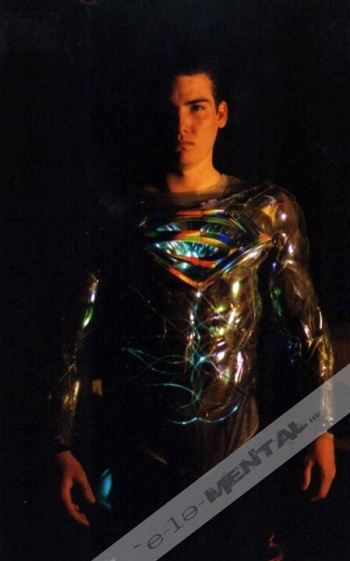 According to the proposed storyline, The Eradicator would wind up helping Superman over the course of the film and eventually turn itself into a suit of armor that would help Kal-El regain the powers he'd lost. The script for Superman Lives was originally written by Kevin Smith, though the plot was dictated by producer Jon Peters, who earned a lot of notoriety over the years for his demands surrounding the movie (such as getting rid of the iconic blue-and-red costume because it was "too faggy"). After he left the project, Burton described the experience as one of the worst of his life, largely thanks to Peters: "I basically wasted a year. A year is a long time to be working with somebody that you don't really want to be working with." Based on all these pieces of art, I can't say I blame Burton for leaving the project. It looks like Superman Lives would've been on par with Catwoman in terms of quality and faithfulness to the franchise.